The Hagan Foundation is named for Dr. Cornelius Hagan. 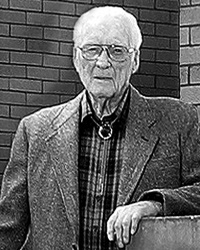 Dr. Hagan was a retired Spokane ear, nose and throat specialist and a life-long lover of books. He was a 1935 graduate of the Medical College of Virginia in Richmond. He completed his internship and surgical residency at Englewood Hospital in New Jersey, followed by another internship and residency with the Ear, Nose and Throat Service at Columbia - Presbyterian Medical School and Babies Hospital in New York City. World War II brought Dr. Hagan to Spokane. Here he completed his tour of duty with the U.S. Air Corps at Fort George Wright. Dr. Hagan stated that, after a brief vacation, he and his wife came back to Spokane and stayed, practicing medicine until his retirement in 1978. In 1997, Dr. Hagan established the Hagan Foundation to support charitable initiatives in the Spokane community. The foundation's emphasis is on education. For many years Dr. Hagan and the Hagan Foundation quietly supported literacy and book-purchase initiatives at the Community Colleges of Spokane. This includes the establishment of the Hagan Students' Book Endowment in 1999 which provides assistance to full-time community college students who need help purchasing text books. Because improving SCC library acquisitions in the humanities is a major emphasis of SCC center for the humanities, Dr. Hagan has also made a significant contribution to the center's campaign. This donation, coupled with Dr. Hagan's and the Hagan Foundation's generous support of literacy initiatives at CCS, makes it very fitting for the center to bear the Hagan Foundation name. Dr. Hagan's generosity deserves recognition and is sincerely appreciated by the CCS Foundation, the community colleges and the students we serve. Dr. Hagan passed away Feb. 23, 2012, but his legacy lives on in the projects he supported. The Hagan center is funded by a growing Community Colleges of Spokane Foundation Endowment. The endowment campaign, which has been generously supported by the community, was also augmented by a National Endowment for the Humanities (matching) Challenge Grant.